TJ Hughes are known as the discount department store who specialise in quality products at a great price. 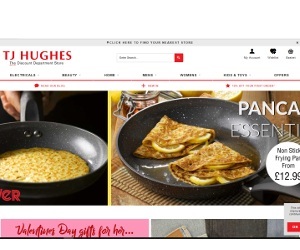 Whether you're looking for electricals, beauty products or clothing, TJ Hughes have it covered. They cater for men, women and children's clothing, stocking hundreds of popular brands including; Ralph Lauren, Yves Saint Lauren, Gucci, Guess and Karen Millen. TJ Hughes offer some huge discounts across a range of products, they have a dedicated home section where you can find everything you'll need for every room in the house as well as an extensive garden department. You can visit their website to see their full range of products and check out their brilliant offers in the process. TJ Hughes have offers all year round with up to 80% off and new products are regularly added to the sale section so make sure you continue to check back to keep on top of all the best deals.